Whether you are a newbie or a pro, if you are looking for gears to protect you from any sport, you have to do thorough research. There are a lot of brands and different tools and equipment out in the market. With each having unique features, which one do you actually choose? If you are looking for a boxing headgear and if you are after an original, old school design that promises an optimal result without compromise, try the Rival RHG2 Traditional Headgear. 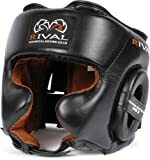 Rival Boxing Gear is a Canadian-owned brand name offering stylish and innovative products developed specifically for boxing market. It creates and distributes a variety of products ranging from boxing apparels, aqua bags, body protectors, footwear, gloves, and various boxing accessories. It distributes its products worldwide. Made of soft, supple, and water-resistant suede leather. Designed with reduced sized cheek guards which help increase vision in the ring. Has dual rear hook-hook-and-loop adjustable straps. The chin straps are fully adjustable. Some users have reported that the size is too small and does not fit well. ​Users have reported the Rival Traditional Boxing Gear to have great padding that is very comfortable. Its padding covers the cheeks, head, as well as the back of the head to offer maximum protection from potential injuries that may occur during a fight. A good thing about this is, even though the padding is quite thick and thorough, the whole gear feels very lightweight still. Preferred by many veteran ring fighters, this protective headgear has an ultra sleek and more lightweight design. This feature makes the gear lighter and easier to carry. Players will not have a hard time carrying in on their heads. Another advantage of using this kind of protective gear is that it does not make your head appear bigger. In fighting, you do not want to be an available and open target as much as possible to avoid being hit by your opponent. Moreover, this ultra sleek and thinner design allows the fighter to have the maximum mobility that will let him move quickly. This way it will be more possible and more comfortable to avoid hits and punches from the opponent. This gear is made of leather with a microsuede interlining. This is designed so to help absorb moisture produced by this face during the fight. One of the general concerns expressed by fighters regarding using headgears is that their visions are blocked because of too much coverage on the face. This is true especially when you are using a full-face gear that is designed to keep your whole face protected. To solve this usual problem, the RHG2 is designed with reduced cheek guards. The gear is not completely covered on the cheeks, nor it is bare. Because of this reduced cheek guard, the vision of the player is increased. ​It also follows that because of this, players will have better peripheral vision. You will be able to see correctly both left and right, up and down. Although there are cheek protections, these do not hinder the fighter from seeing when the hooks from the opponent are coming up. The chin strap that is used to lock the hear is fully adjustable. So it is not really a problem when it comes to differing sizes of users. Because of this, the chin strap will not go too far back to the point that it is already choking you around the throat. In fact, it gets right underneath on your chin, giving you just the perfect fit. Another plus point of the chin strap is the fact that it uses a leather strap instead of Velcro. So, you will see that it has a leather strap standard belt buckle. Moreover, it also has a flap cover to cover the metal belt buckle. This gear is also designed with ear holes that are nicely located on a proper level. Users have shared that the ear holes do not feel light they are off-placed (i.e., too high or too low). Apart from this, the ear holes are also designed with protector so in case you received a hit on the side, it will protect you from trauma because of the padding. This gear does not use the typical donut ring that you can see on some headgear that is designed to protect the player. However, it gives a generous amount of padding. The gear uses a minimalist design. You will initially notice the stitched logo on the top and the screen printed logo on both of the sides. This gear uses a lace-up closure which can be found on the top. This will make it easier for any user to adjust the fit according to his / her preference. At the back of the gear is the standard Velcro strap to lock it and easily adjust according to the width of your head as well. You will also notice that the back part if securely padded to offer good protection in case you got him from the back or fell down. Like most boxing headgear, this one also has a nice tapered neck so that if you use it, it will feel comfortable. It will also allow your head from freely moving around. The Rival RHG2 Traditional Headgear is loved by many fighters because of its optimal features. It is able to protect the player from possible superficial elements because of its padding, cheeks guards, ear holes/protection and padding. Another factor about this gear that makes it a perfect protective gear is its lightweight, resulting in maximum mobility. Despite the generous amount of padding, it remains to have a sleek and ultra-thin feature. It caters both protection and function.